Reading 'The Independent' newspaper last week it was great to read the very positive article about students progress in the new Halewood Centre for Learning in Knowsley. The exciting very innovative design of the buildings, has caused considerable interest and attracts numerous visitors from all over the UK and abroad. Whilst I really love it, along with the majority of visitors, not every one likes it. The concept of several learning bases, agile learning spaces with very few walls, the massive atrium and innovative FF&E solutions all provoke a discussion, but it is a step too far for some. Therefore to get the really positive response from the parents is a massive vote of confidence in the concept and, in this case, the work of the Headteacher, staff and students. Crucially students had a big say in the design stages of the school. The fantastic environments clearly HAVE made a difference. It looks as though it is beginning to achieve its aspirations, students want to be there, parents love it, attainment seems to be improving whilst absence and behaviour improves. Regular readers know I love the design of Halewood, not only is it really innovative, the build quality achieved by Balfour Beatty is also fab. I also admire the bravery of the initial design and concept. 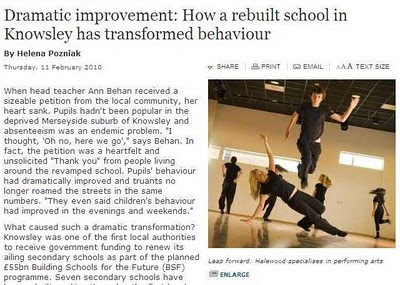 Depressingly, I still come across people who can't see that the way we deliver education has to change - or the spaces students work in. It's unbelievable really. I like getting feedback on the blog. Recently I have received a comment on this post about the construction company used. As they are one of my major clients, obviously it is not in my interest to post it. Sorry to the anonyous author concerned.